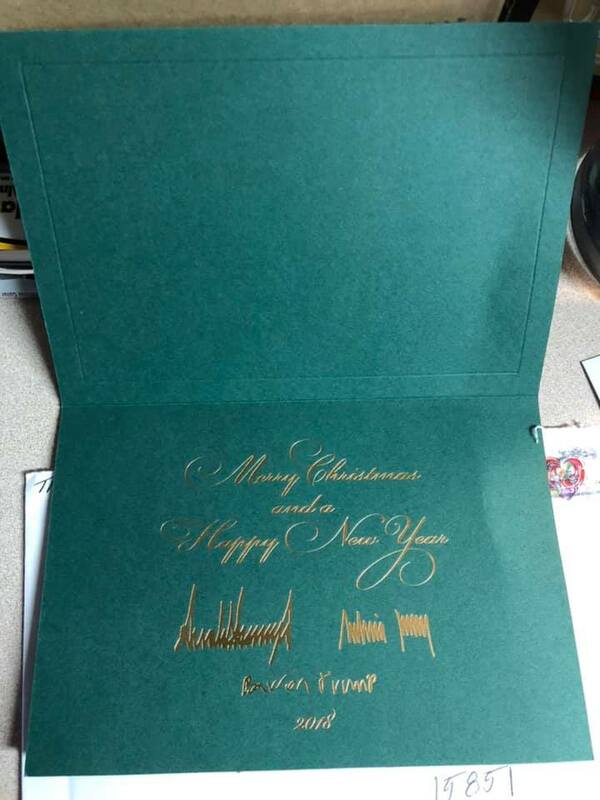 REYNOLDSVILLE, Pa. (EYT) – A Christmas card from President Trump is the latest in the flood of support for a terminally ill Reynoldsville teenager. Fourteen-year-old Maddox Hyde, an eighth-grade student at DuBois Area Middle School, was diagnosed eight years ago with neuroblastoma, a cancer of the adrenal glands. In December, Maddox’s family received news from doctors that he had just weeks to live. Following his terminal diagnosis, Maddox made a wish to fill his house with Christmas cards, and a campaign began via Facebook to reach out with that request. Thanks to the power of social media, the campaign has grown well beyond expectations. 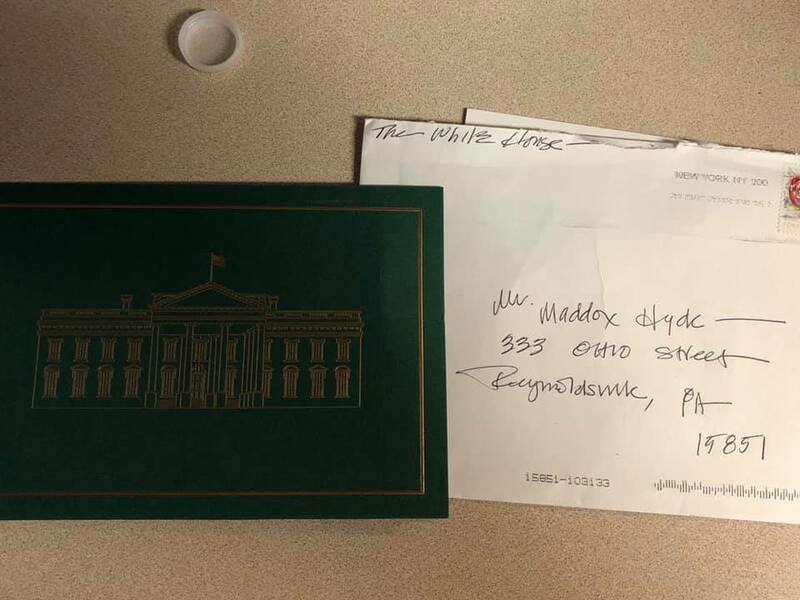 On Friday, his family announced via the Friends of Maddox Facebook group, that Maddox received a Christmas card from the White House. The card was signed by President Donald Trump, First Lady Melania Trump and their son Barron. The card is one of thousands Maddox has received in what has become a global campaign stretching from Pennsylvania to Alaska to Australia. As word went out, people started joining the Friends of Maddox Facebook group and spreading the word. In early December, Maddox’s story began to hit the news, first with regional news sources, like Centre Daily Times, and then, as the cards began to arrive, other news sources picked up the story. From KRIS 6 News in Corpus Christi, Texas, and WSVN 7 News in Miami to WISN 12 News in Milwaukee, Wis., and even across the globe at VTV8 in Vietnam, Maddox’s story spread like wildfire. Jackie Green, a special education teacher for fifth and sixth graders in the small country town of Pleasant Hill, Mo., made their local news after her students sent Maddox cards and letters that they created themselves. Maddox has even been featured in Heavy.com, as well as both TrekToday and Bounding into Comics after legendary actor William Shatner took to Twitter to urge others to spread the word and join the campaign to send cards to Maddox. With word spreading quickly across the globe, the mail poured in. Deborah Franz, postmaster for the Reynoldsville Post Office, said in December she had personally seen cards and packages come from not only across the United States, but also from across the globe, such as Denmark, Africa, Taiwan, Hong Kong, China and Australia, to name a few. Franz said 10,000 items arrived for Maddox in one day alone. The Friends of Maddox Facebook group has continued to grow, as well, with over 5,300 members from around the world. Those interested in following Maddox’s story can join the group here.